Case study | Darcom Innovations inc.
As a specialist in transforming shipping containers into useful and habitable spaces, DARCOM Innovations is joining forces with Premier Tech Aqua and extending its expertise with the introduction of mobile ecological comfort stations. With the potential to revolutionize the market of self-cleaning sanitary units, these comfort stations have a spacious interior and can be immediately seen to offer modern and secure accommodations that are clean, airy, and pleasant to use. 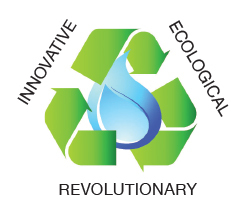 They employ Biofiltre Ecoflo, the popular technology for treating used water from Premier Tech Aqua. Without using energy, this technology treats used water with a 100% natural filtering system. Darcom has adopting this solution, which does not create any odour, for the treatment of grey water and used water in its comfort stations. Able to accommodate up to twenty toilets, the modular approach can be easily adapted for big projects and multi-stage installations. Darcom is offering cities, construction site managers, and events promoters an economical and efficacious solution that resolves the well-known problems associated with portable chemical toilets. Portable chemical toilets typically collect used water in large external reservoirs that are exposed to climatic conditions. Heated by the sun, the organic matter inevitably creates unpleasant odours for users and neighbouring businesses and homes. In addition to the strong smell, there are often weekly emptyings of the reservoirs and the high cost of disposal and washing with chemical agents that are more or less noxious to the environment. 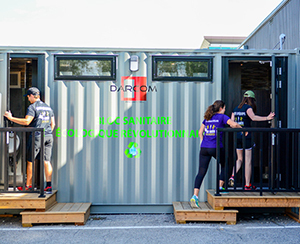 In contrast, DARCOM’s comfort station is simply supplied by drinkable water at the time it is connected and then only twice per month, or as needed. 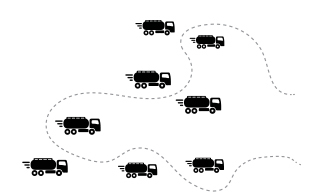 When the installation has to be dismantled or moved, the DARCOM teams take care of transporting the units, emptying and cleaning the septic tanks, maintenance of the biofilters, and secure disposal of the water, making sure that it does not infiltrate into the soil. and robustness, trustworthiness and flexibility, DARCOM’s comfort stations are easily moveable by truck, train, boat, or even helicopter or airplane. They can be installed or dismantled anywhere in an hour and are ready to be used as soon as the components are connected. After the water for the system has been connected, the water coming from the toilets and sinks is sent to primary treatment, at which stage large particles are removed from the water and treated. The water is then spread over the biofilter where residual particles and organic matter as well as the majority of faecal coliform bacteria are removed. Pumped to the bottom of the filter, the water is directed into a unit where it is disinfected by ultra-violet radiation and into a chlorination unit for additional removal of faecal coliform bacteria. The secure use of the water for flushing the toilets is thus ensured. A separate reservoir filled with drinkable water supplies the sinks for users to wash their hands. 2 to 4 litres of water is what a human drinks each day. By 2025, 1,8 billion people will be living in places where is a lack of water. In developing countries, 80 % of used water is discharged without treatment. 11 % of the world’s population does not have access to drinkable water. Since 1900, 11 million people have died as the result of drought. Every 20 seconds a child somewhere in the world dies from not having access to drinkable water. Our ecological comfort station is being used by 550 people daily. at a cost of +/- $200 per emptying. Only 2 emptyings have been necessary. Darcom is helping to save drinkable water!